Costa Rica is a small country in Central America known for its lush jungles and awesome waves to surf. I live in Costa Rica and aside from an abundance of rain in September and October, you will fall in love with this country and its people. Here are my top ten reasons for you to visit Costa Rica. If you are a thrill-seeker and someone that craves adventure, then Costa Rica is definitely the place for you. It’s home to the original canopy tour that lets you travel through the jungle like a monkey, and it’s known for its zip-lining tours, whitewater rafting on world class rapids, kayaking, scuba diving, cliff diving, sky diving and pretty much anything else extreme that you can come up with. Costa Rica is a great place for the unadventurous as well, or for those who just need a break in between adventures. With almost 1,000 miles of coastline, Costa Rica is home to some lovely beach. Whether you choose to visit a public beach in Santa Teresa or maybe your hotel has its own private beach, you will definitely be delighted to feel the sand between your toes and warm sun on your face. If you are looking for lots of sun, maybe avoid the rainy season, September and October. Costa Rica is famous for its waves and is one of the top three surfing destinations in the world. The water is warm year round and the waves are great any time of the year as well. The rainy season can often be the best time to go when it isn’t as crowded. The surf is also good on both sides of the country and there are a lot of great breaks to choose from. If you are new to surfing, there are also a lot of great surf schools like Perfect Sunset Surfing and Spanish School in Santa Teresa that will teach you everything you need to know. The slowest mammals in the world, they’re cute and they can be found all around the country. Look up in the trees as you drive along the road or hike in the jungles and you might just see one or two. If you want to get closer, then you should visit the Sloth Sanctuary to learn more about them – you might fall in love with them just like I did. To learn some sloth facts, ask us and we will teach you more than Spanish lessons. I have 10 years living in this amazing country. And I love to share with you all I learned from nature. Like any country, Costa Rica has its own tastes, and its main staple tends to be rice and beans aka Gallo Pinto. A lot of its main dishes use a sauce that you will quickly come to love called Lizano Salsa. It’s kind of like a BBQ sauce, but kind of not. Hard to explain, for sure, but they put it on everything and people love it so much they even sell it at the airport. Costa Rica is also a huge grower of coffee, bananas and chocolate. If you visit Quepos, be sure to take a tour at Villa Vanilla farms to see how they make chocolate as well as vanilla, pepper, cinnamon and more. About 25% of the country is made up of protected national parks and rainforests which hold 5% of the worlds biodiversity. Aside from taking canopy and zip-lining tours, there is also a tour that offers a aerial tram ride through the rainforest treetops guided by an expert naturalist. This is perfect for the less adventurous. One of the main tourist attractions, Costa Rica currently has five listed active volcanoes and 200+ volcanic formations. Because of them, the country has very rich and fertile soil which helps make it so lush and full of life. The volcanoes and surrounding areas are also popular areas for hiking, camping and mountain biking. Aside from sloths, Costa Rica is full of cheeky monkeys who might steal your food if you aren’t watching, and if it’s not the monkeys, it’s the raccoons – they run around in the daylight with a similar outlook on life to the honey badger of South Africa. 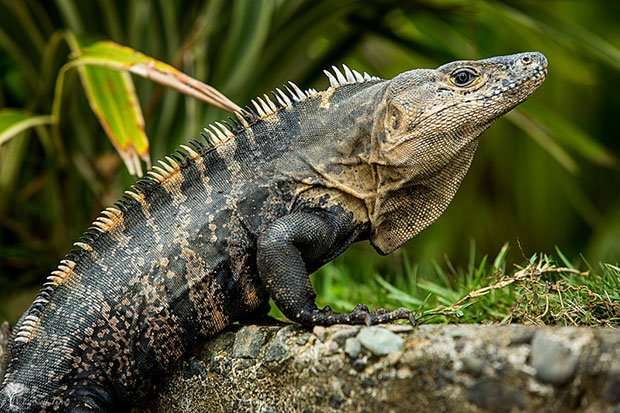 There are lizards, geckos and iguanas all over the place, and Costa Rica is also known as a great bird-watching country with over 812 recorded species found there. With plans of being the first carbon neutral country in the world by 2012, Costa Rica is also a destination popular for its eco-tourism – some might even say they were the first to start it. With many eco-friendly hotels and lodges across the country and tour operators attempting to be as low-impact as possible, they are well on their way to full sustainaibility. You can feel good about visiting and not leaving a big footprint.